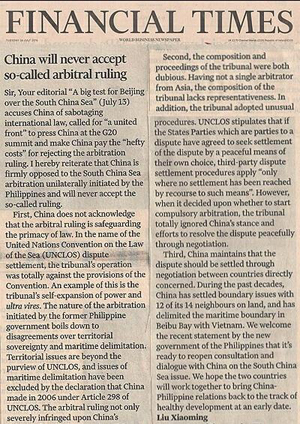 The Financial Times Publishes A Signed Letter by Ambassador Liu Xiaoming Entitled "China will never accept so-called arbitral ruling"
Sir, Your editorial "A big test for Beijing over the South China Sea" (July 13) accuses China of sabotaging international law, called for "a united front" to press China at the G20 summit and make China pay the "hefty costs" for rejecting the arbitration ruling. I hereby reiterate that China is firmly opposed to the South China Sea arbitration unilaterally initiated by the Philippines and will never accept the so-called ruling. First, China does not acknowledge that the arbitral ruling is safeguarding the primacy of law. In the name of the United Nations Convention on the Law of the Sea (UNCLOS) dispute settlement, the tribunal's operation was totally against the provisions of the Convention. An example of this is the tribunal's self-expansion of power and ultra vires. The nature of the arbitration initiated by the former Philippine government boils down to disagreements over territorial sovereignty and maritime delimitation. Territorial issues are beyond the purview of UNCLOS, and issues of maritime delimitation have been excluded by the declaration that China made in 2006 under Article 298 of UNCLOS. The arbitral ruling not only severely infringed upon China's territorial sovereignty and maritime rights and interests in the South China Sea, but also severely violated the credibility and authority of international law. Second, the composition and proceedings of the tribunal were both dubious. Having not a single arbitrator from Asia, the composition of the tribunal lacks representativeness. In addition, the tribunal adopted unusual procedures. UNCLOS stipulates that if the States Parties which are parties to a dispute have agreed to seek settlement of the dispute by a peaceful means of their own choice, third-party dispute settlement procedures apply "only where no settlement has been reached by recourse to such means". However, when it decided upon whether to start compulsory arbitration, the tribunal totally ignored China's stance and efforts to resolve the dispute peacefully through negotiation. Third, China maintains that the dispute should be settled through negotiation between countries directly concerned. During the past decades, China has settled boundary issues with 12 of its 14 neighbours on land, and has delimited the maritime boundary in Beibu Bay with Vietnam. We welcome the recent statement by the new government of the Philippines that it's ready to reopen consultation and dialogue with China on the South China Sea issue. We hope the two countries will work together to bring China-Philippine relations back to the track of healthy development at an early date.